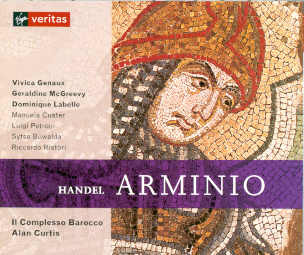 The 2002 International Handel Recording Prize has been awarded to Alan Curtis and Il Complesso Barocco for their recording of the opera Arminio (Virgin Veritas). A sense of musicological value rarely contributes to significant awards, but the winner of the newly inaugurated Handel Recording Prize was chosen by a specialist panel, including Anthony Hicks (The Handel Institute and Early Music Review critic), Brad Leissa (The American Handel Society and co-producer of gfhandel.org), Michael Pacholke (The Hallische Händel Ausgabe - the new scholarly edition of Handel's complete works produced in Halle, Germany), Stanley Sadie (editor of The New Grove Dictionary of Music and Gramophone critic), and David Vickers (co-producer of gfhandel.org and Andante critic). Full and equal consideration was given to both the quality of performances and the significance of their contribution to Handelian knowledge. 2001 was a year that demonstrated an impressive breadth and quality of Handel performances on disc, so it was especially crucial to nominate a worthy winner: the world premiere recording of Arminio - an opera often harshly criticised by Handel biographers - is a fine musically convincing performance that furthermore challenges preconceptions about Handel's operatic work in the late 1730s. Stanley Sadie is convinced that Curtis' industrious and imaginative work "might change our views about the later operas". Musicologist Michael Pacholke expanded upon this, insisting that Curtis' committed interpretation "is very powerful evidence of the quality of an opera whose acceptance suffered very much under some devaluing descriptions by commentators who probably never heard or looked carefully at the music". Brad Leissa acknowledged that Curtis prepared the performing edition himself from manuscripts, but was keen to emphasise its "outstanding soloists and vivacious but controlled orchestral support". The winner was selected from a shortlist of over 20 recordings of Handel's music commercially released during 2001. Reissues, compilations, and CDs featuring music by other composers were not eligible for contention. Rinaldo Alessandrini's Il Trionfo del Tempo e del Disinganno (Opus 111) was runner-up, and Emma Kirkby's Sacred Cantatas (BIS) was also nominated. - A live recording from 1991. Airs français or 'Sans y penser' (HWV 155); Four Songs in different languages (HWV deest) -- includes Sans y penser, Quand on suit l'amoureuse loi, Der Mund spricht zwar, and Dicente mis ojos; The Dream or 'Beneath a shady willow' (HWV deest); The Beauteous Cloe or 'Cloe, you're witty' (HWV deest); Di godere ha speranza il mio core / Oh my dearest, my lovely creature (HWV 228.7); Strephon's Complaint of Love: Oh cruel Tyrant Love (HWV 228.14); Minuet in G major (HWV 530); Minuet in G minor (HWV 543); An Answer to Collin's Complaint: Ye winds to whome Collin complains (HWV 228.23); Charming Cloris: Ask not the cause / The poor Shepherd: The Sun was sunk beneath the Hills (HWV 228.2); Minuet in D major (HWV 506); Minuet in A major (HWV A 15.7); Yes, I'm in love (HWV 228.24); The unhappy Lovers: As Celia's fatal arrows flew (HWV 228.1); The Satyr's Advice to a Stock-Jobber: On the shore of a low ebbing sea / Ye Swains that are courting a Maid / Molly Mogg: Says my uncle, I pray you discover (HWV 228.15); The faithful Maid / The Melancholy Nymph: 'Twas when the seas were roaring (Ballad from The What d'ye Call It) (HWV 228.19); I like the am'rous youth that's free (Song from The Universal Passion) (HWV 228.11); Love's by the frailty of the mind (HWV 218); Hunting Song or 'The morning is charming' (HWV 226); Stand round, my brave boys (Song made for the Gentlemen Volunteers of the City of London) (HWV 228.18); March in G (HWV 418); From scourging rebellion or A Song on the Victory obtained over the Rebels by His Royal Highness the Duke of Cumberland (HWV 228.9). Suite No. 1 in A major; Suite No. 2 in F major; Suite No. 3 in D minor; Suite No. 4 in E minor; Suite No. 5 in E major. Lascia ch'io pianga (Rinaldo), transposed; Sonata No. 1, Opus 5 (excerpt); Cara sposa (Rinaldo); Armati, oh core (Admeto); Sonata No. 2, Opus 5 (excerpt); Se il cor ti perde (Tolomeo), with Anne Cambier, soprano; Stille amare (Tolomeo); Sonata No. 5, Opus 5 (excerpt); Svegliatevi nel core (Giulio Cesare); Sonata No. 4, Opus 5 (excerpt); Pena tiranna (Amadigi); Sinfonia from Orlando; Tacero (Agrippina). Quondo in calma ride il mare; Nell'africane selve; Che vai pensando; La Lucrezia; Giù nei Tartarei regni; Dalla guerra amorosa; Tacete ohime. Sonata in D major, Op.1 No. 13 (HWV 371); Sonata in F major - Walsh's edition of Op. 1 No. 12; Sonata in D minor (HWV 359a); Sonata in A major, Op. 1 No. 3 (HWV 361); Sonata in G minor, Op. 1 No. 6 (HWV 364a); Sonata in A major - "Roger's" edition of Op. 1 No.10; Sonata in E major - "Roger's" edition of Op. 1 No. 12; Sonata in G major (HWV 358); Andante in A minor (HWV 412); Allegro in C minor (HWV 408). Arias from Admeto, Serse, Amadigi di Gaula, Faramondo, Alessandro, Rodrigo, Partenope, Teseo, Siroe, and Tamerlano.